Announcing the release of new app called Tweeps version 2.0 for iPad, iPhone and iPod touch. The developer of Tweeps version 2.0 is Dejal Systems. Notable is a fact that Tweeps is a Twitter companion app but isn’t totally Twitter client as you aren’t allowed to post tweets with the app. But on the other hand you’re able to manage and organize your Twitter account. In detail you’re possible to edit your name, bio text, website URL and location, follow/unfollow people, see if someone follows you, block people, and find people. Besides, the developers added iPad support to the app and for this reason Tweeps is available for free, but for a limited time. * Edit the name displayed for your account. * Change the biographical text – the description you write about yourself. * Edit the website URL, previewing it in an integrated web browser. * Set your current location using the device’s GPS, or type a less specific location, and preview on an integrated map view. 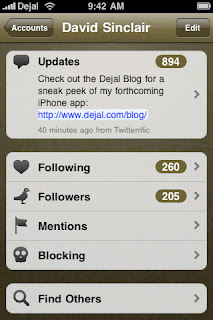 For a limited time, Dejal Tweeps 2.0 is free and available worldwide exclusively through the App Store in the Social Networking category. Dejal is a long-established independent Mac software company, now also producing iPhone OS software.